I have always been fascinated with those individuals who would rather get all wet than carry an umbrella around. I wonder if such people consider an umbrella to be too heavy or it is just the desire to enjoy the cold drops falling from the sky. Whatever logic is behind such a choice, I would not recommend you to follow it. For one thing, umbrellas protect your hairdo, make-up and saucy outfit. Besides, it can be easily incorporated into your stylish look and complement the clothing pieces that you wear. Such an ensemble will by all means make any rainy day more bright and shiny. 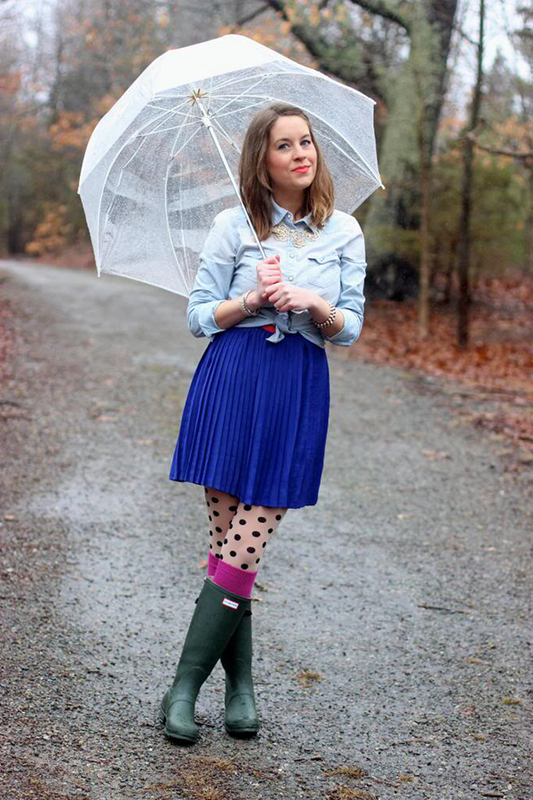 Below are some of the most outstanding ways to style your umbrellas as if it was a part of your trendy look. Here comes my favorite ensemble featuring an umbrella. Although this look is styled in a color palette that does not really correspond with the classic fall shades, the outfit is very applicable to the nasty fall weather. I am absolutely in love with the powder pink cashmere midi coat that is rocked over a magnificent maxi dress in florals. The matching shoes along with the coral stitched handbag, a multi-colored headscarf and a pair of stylish sunglasses complement the look. Yet, the outfit would be complete without this gorgeous umbrella in delicate violet which perfectly fits into the color mood of the ensemble. Unique shapes and creative styles are always on trend, no matter what. If you consider yourself to be a highly artistic individual, then this umbrella in black with the pointy top will speak to you a lot. The piece serves as a styling accessory for the elegant and chic look of the brunette stunner. 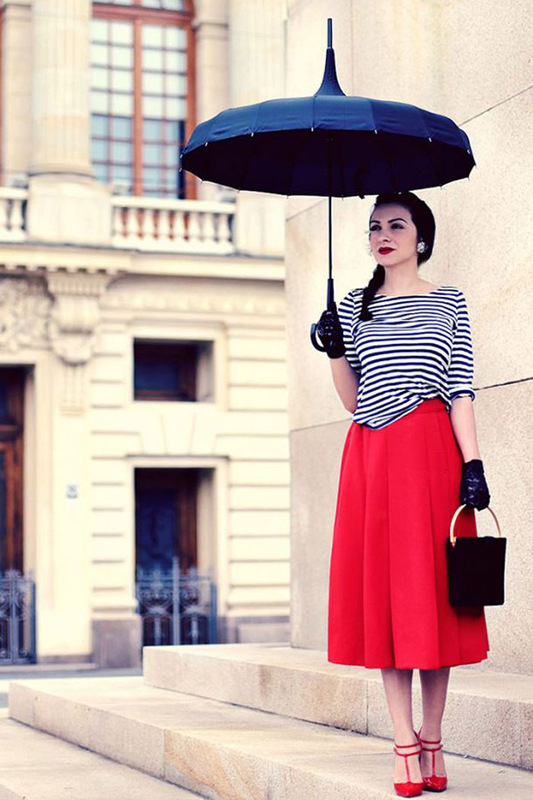 A striped black and white shirt is paired with a lust red midi flare skirt, matching shoes, black gloves and a cute black tote. The intricately designed umbrella brings in a very specific zest to the look and creates an impression of an exquisite Parisian look. Those of you who prefer more funky and edgy looks, here is something that you won’t be able to resist. This see-through cupola-shaped umbrella can complement any outfit possible and make it much more trendy and saucy. In this case, the stunner opted for a pleated mini skirt in blue, light denim shirt, polka dot tights in cream and black, khaki Hunter rainboots and a bunch of accessories. The ensemble looks very solid and in vogue – this is a good way to look stylish and stay warm and dry. Another cool look features a plain black umbrella. There is nothing extraordinary about its style or design; nothing that makes it stand out from the crowd. Yet, the piece perfectly fits into the whole composition making it impossible to imagine the same outfit without this rather classic accessory. The beauty on the image above rocked a pair of bleached skinny jeans along with a light blue tweed coat over the cream blouse. The adorable shoes in gold and cream as well as the matching handbag complete this striking ensemble. One might wonder how a black umbrella ended up in this pastel-shaded composition; yet, seems like this is the only right option in this case. You can also match the design of your umbrella with that of your outfit. For that you will definitely have to purchase more than one piece. Or else try to match your clothing pieces with your saucy accessory. If it is a black and red wide umbrella that we are talking about, I would definitely go for it. The black and white striped dress of the fashionista is paired with a carrot red shirt and black leather jacket. The stylish handbag perfectly matches the pattern of the umbrella, while the elegant scarf in pastels adds a touch of glam to the look. Above were some looks that feature an umbrella. As one can conclude, this accessory is capable of not only protecting you from the heavy rain drops, but also can beautify your outfit and make it more saucy and in vogue.